For a week the amount of virtue in the old house would have supplied the neighborhood. It was really amazing, for everyone seemed in a heavenly frame of mind, and self-denial was all the fashion. Relieved of their first anxiety about their father, girls insensibly relaxed their praiseworthy efforts a little, and began to fall back into old ways. They did not forget their motto, but hoping and keeping busy seemed to grow easier, and after such tremendous exertions, they felt that Endeavor deserved a holiday, and gave it a good many. Jo caught a bad cold through neglect to cover the shorn head enough, and was ordered to stay at home till she was better, for Aunt March didn't like to hear people read with colds in their heads. Jo liked this, and after an energetic rummage from garret to cellar, subsided on the sofa to nurse her cold with arsenicum and books. Amy found that housework and art did not go well together, and returned to her mud pies. Meg went daily to her pupils, and sewed, or thought she did, at home, but much time was spent in writing long letters to her mother, or reading the Washington dispatches over and over. Beth kept on, with only slight relapses into idleness or grieving. All the little duties were faithfully done each day, and many of her sisters' also, for they were forgetful, and the house seemed like a clock whose pendulum was gone a-visiting. When her heart got heavy with longings for Mother or fears for Father, she went away into a certain closet, hid her face in the folds of a dear old gown, and made her little moan and prayed her little prayer quietly by herself. Nobody knew what cheered her up after a sober fit, but everyone felt how sweet and helpful Beth was, and fell into a way of going to her for comfort or advice in their small affairs. "Meg, I wish you'd go and see the Hummels. You know Mother told us not to forget them." said Beth, ten days after Mrs. March's departure. "I'm too tired to go this afternoon," re;lied Meg, rocking comfortably as she sewed. "Can't you, Jo?' asked Beth. "Too stormy for me with my cold." "I thought it was almost well." "It's well enough for me to go out with Laurie, but not well enough to go to the Hummels'," said Jo, laughing, but looking a little ashamed of her inconsistency. "Why don't you go yourself?" asked Meg. "I have been every day, but the baby is sick, and I don't know what to do for it. Mrs. Hummel goes away to work, and Lottchen takes care of it. But it gets sicker and sicker, and I think you or Hannah ought to go." "Ask Hannah for some nice little mess, and take it round, Beth, the air will do you good," said Jo, adding apologetically, "I'd go but I want to finish my writing." "My head aches and I'm tired, so I thought maybe some of you would go," said Beth. "Amy will be in presently, and she will run down for us, suggested Meg. So Beth lay down on the sofa, the others returned to their work, and the Hummels were forgotten. An hour passed. Amy did not come, Meg went to her room to try on a new dress, Jo was absorbed in her story, and Hannah was sound asleep before the kitchen fire, when Beth quietly put on her hood, filled her basket with odds and ends for the poor children, and went out into the chilly air with a heavy head and a grieved look in her patient eyes. It was late when she came back, and no one saw her creep upstairs and shut herself into her mother's room. Half an hour after, Jo went to `Mother's closet' for something, and there found little Beth sitting on the medicine chest, looking very grave, with red eyes and a camphor bottle in her hand. "Christopher Columbus! What's the matter?" cried Jo, as Beth put out her hand as if to warn her off, and asked quickly, "You've had the scarlet fever, havent't you?" "Then I'll tell you. Oh, Jo, the baby's dead!" "Mrs. Hummel's. It died in my lap before she got home," cried Beth with a sob. "My poor dear, how dreadful for you! I ought to have gone," said Jo, taking her sister in her arms as she sat down in her mother's bit chair, with a remorseful face. "It wasn't dreadful, Jo, only so sad! I saw in a minute it was sicker, but Lottchen said her mother had gone for a doctor, so I took Baby and let Lotty rest. It seemed asleep, but all of a sudden if gave a little cry and trembled, and then lay very still. I tried to warm its feet, and Lotty gave it some milk, but it didn't stir, and I knew it was dead." "Don't cry, dear! What did you do?" "I just sat and held it softly till Mrs. Hummel came with the doctor. He said it was dead, and looked at Heinrich and Minna, who have sore throats. `Scarlet fever, ma'am. Ought to have called me before, ' he said crossly. 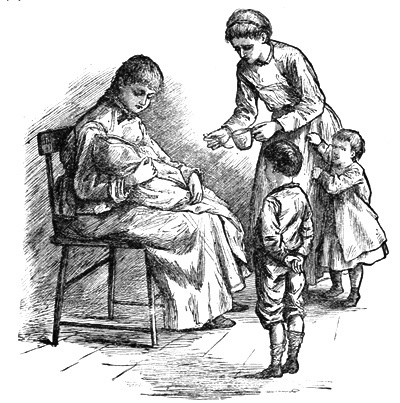 Mrs. Hummel told him she was poor, and had tried to cure baby herself, but now it was too late, and she could only ask him to help the others and trust to charity for his pay. He smiled then, and was kinder, but it was very sad, and I cried with them till he turned round all of a sudden, and told me to go home and take belladonna right away, or I'd have the fever." "No, you won't!" cried Jo, hugging her close, with a frightened look. "Oh, Beth, if you should be sick I never could forgive myself! What shall we do?" "Don't be frightened, I guess I shan't have it badly. I looked in Mother's book, and saw that it begins with headache, sore throat, and queer feelings like mine, so I did take some belladonna, and I feel better," said Beth, laying her cold hands on her hot forehead and trying to look well. "If Mother was only at home!" exclaimed Jo, seizing the book, and feeling that Washington was an immense way off. She read a page, looked at Beth, felt her head, peeped into her throat, and then said gravely, "You've been over the baby every day for more than a week, and among the others who are going to have it, so I'm afraid you are going to have it, Beth. I'll call Hannah, she knows all about sickness." "Don't let Amy come. She never had it, and I should hate to give it to her. Can't you and Meg have it over again?" asked Beth, anxiously. "I guess not. Don't care if I do. Serve me right, selfish pig, to let you go, and stay writing rubbish myself!" muttered Jo, as she went to consult Hannah. "Now I'll tell you what we'll do," said Hannah, when she had examined and questioned Beth, "we will have Dr. Bangs, just to take a look at you, dear, and see that we start right. Then we'll send Amy off to Aunt March's for a spell, to keep her out of harm's way, and one of you girls can stay at home and amuse Beth for a day or two." "I shall stay, of course, I'm oldest," began Meg, looking anxious and self-reproachful. "I shall, because it's my fault she is sick. I told Mother I'd do the errands, and I haven't," said Jo decidedly. "Which will you have, Beth? There ain't no need of but one," aid Hannah. "Jo, please." And Beth leaned her head against her sister with a contented look, which effectually settled that point. "I'll go and tell Amy," said Meg, feeling a little hurt, yet rather relieved on the whole, for she did not like nursing, and Jo did. Amy rebelled outright, and passionately declared that she had rather have the fever than go to Aunt March. Meg reasoned, pleaded, and commanded, all in vain. Amy protested that she would not go, and Meg left her in despair to ask Hannah what should be done. Before she came back, Laurie walked into the parlor to find Amy sobbing, with her head in the sofa cushions. She told her story, expecting to be consoled, but Laurie only put his hands in his pockets and walked about the room, whistling softly, as he knit his brows in deep thought. Presently he sat down beside her, and said, in his most wheedlesome tone, "Now be a sensible little woman, and do as they say. No, don't cry, but hear what a jolly plan I've got. You go to Aunt March's, and I'll come and take you out every day, driving or walking, and we'll have capital times. Won't that be better than moping here?" "I don't wish to be sent off as if I was in the way," began Amy, in an injured voice. "Bless your heart, child, it's to keep you well. You don't want to be sick, do you?" "No, I'm sure I don't, but I dare say I shall be, for I've been with Beth all the time." "That's the very reason you ought to go away at once, so that you may escape it. Change of air and care will keep you well, I dare say, or if it does not entirely, you will have the fever more lightly. I advise you to be off as soon as you can, for scarlet fever is no joke, miss." "But it's dull at Aunt March's, and she is so cross," said Amy, looking rather frightened. "It won't be dull with me popping; in every day to tell you how Beth is, and take you out gallivanting. The old lady likes me, and I'll be as sweet as possible to her, so she won't peck at us, whatever we do." "Will you take me out in the trotting wagon with Puck?" "On my honor as a gentleman." "And come every single day?" "And bring me back the minute Beth is well?" "And go to the theater, truly?" "A dozen theaters, if we may." "Well--I guess I will," said Amy slowly. "How is the little dear?" asked Laurie, for Beth was his especial pet, and he felt more anxious about her than he liked to show. "She is lying down on Mother's bed, and feels better. The baby's death troubled her, but I dare say she has only got cold. Hannah says she thinks so, but she looks worried, and that makes me fidgety," answered Meg. "What a trying world it is!" said Jo, rumpling up her hair in a fretful way. "No sooner do we get out of one trouble than down comes another. There doesn't seem to be anything to hold on to when Mother's gone, so I'm all at sea." "Well, don't make a porcupine of yourself, it isn't becoming. Settle your wig, Jo, and tell me if I shall telegraph to your mother, or do anything?" asked Laurie, who never had been reconciled to the loss of his friend's one beauty. "That is what troubles me," said Meg. "I think we ought to tell her if Beth is really ill, but Hannah says we mustn't, for Mother can't leave Father, and it will only make them anxious. Beth won't be sick long, and Hannah knows just what to do, and Mother said we were to mind her, so I suppose we must, but it doesn't seem quite right to me." "Hum, well, I can't say. Suppose you ask Grandfather after the doctor has been." "We will. Jo, go and get Dr. Bangs at once," commanded Meg. "We can't decide anything till he has been." "Stay where you are, Jo. I'm errand boy to this establishment," said Laurie, taking up his cap. "I'm afraid you are busy," began Meg. "No, I've done my lessons for the day." "Do you study in vacation time?" asked Jo. "I follow the good example my neighbors set me," was Laurie's answer, as he swung himself out of the room. "I have great hopes for my boy," observed Jo, watching him fly over the fence with an approving smile. "He does very well, for a boy," was Meg's somewhat ungracious answer, for the subject did not interest her. "Go away. No boys allowed here." "No more than I expected, if you are allowed to go poking about among poor folks. Amy can stay and make herself useful if she isn't sick, which I've no doubt she will be, looks like it now. Don't cry, child, it worries me to hear people sniff." Amy was on the point of crying, but Laurie slyly pulled the parrot's tail, which caused Polly to utter an astonished croak and call out, "Bless my boots!" in such a funny way, that she laughed instead. "What do you hear from your mother?" asked the old lady gruffly. "Father is much better," replied Jo, trying to keep sober. "Oh, is her? Well, that won't last long, I fancy. March never had any stamina," was the cheerful reply. "Ha, ha! Never say die, take a pinch of snuff, goodbye, goodbye!" squalled Polly, dancing on her perch, and clawing at the old lady's cap as Laurie tweaked him in the rear. "Hold your tongue, you disrespectful old bird! And, Jo, you'd better go at once. It isn't proper to be gadding about so late with a rattlepated boy like..."
`rattlepated' boy, who was shaking with laughter at the last speech. "I don't think I can bear it, but I'll try," thought Amy, as she was left alone with Aunt March. "Get along, you fright!" screamed Polly, and at that rude speech Amy could not restrain a sniff.